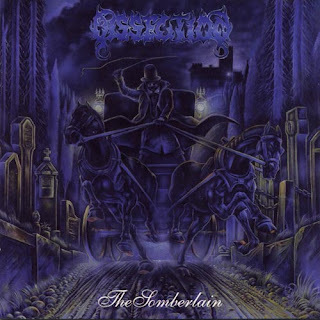 Around the time of the release of “The Somberlain,” Sweden was experiencing a massive output of death metal. There were the giants of the genre and there were even more bands releasing demos left and right. Dissection, though, would embrace the darker sounds of black metal and help spawn a whole new wave of terrific bands from the country in Sacramentum, Arckanum, Lord Belial, Vinterland, etc. When metalheads usually discuss which of Dissection’s first two albums are better, it’s usually a pretty split crowd between this one and “Storm of the Light’s Bane,” but both records are worthy of praise for not only their influence, but for how damn good they are. “The Somberlain” has a dark feel to the music (as do most black metal albums), but the atmosphere on this album is quite different from others. It’s cold, chilling, haunting and absolutely brilliant. A song with the title “Black Horizons” should sound evil, and it does throughout its eight minutes of life. Eight minutes of tempo changes, dark and beautiful melodies, sinister tremolos, acoustic guitars and Nodtveidt’s vicious vocals make for an insanely good song, and album for that matter, as a lot of the songs here contain a lot of the same kind of elements. Every song (not counting the instrumentals) has a fair amount of melody, whether it’s through the tremolo patterns or a soothing melodic solo that pierces through the blistering riffs, Dissection always has just the right amount of melody. In addition to the cold aura and the melodic tendencies of the band, every other member of the band does their part to perfection. Nodtveidt’s vocals are harsh growls that compliment the bleak backdrop very well. His vocals are also pretty understandable and not just guttural shrieks. The rhythm section on this album is also top-notch, as I was able to find a standout moment on the drumming on every song. I was also able to hear the bass quite fine, as it thumped along or even provided some great fills in the background of the tremolo frenzies. “The Somberlain” proves to be a game-changer for not only the band (who would go on to top this effort with their masterpiece “Storm of the Light’s Bane”), but for the Swedish black metal movement as well. When it comes to getting lost in a flurry of melody and darkness, there just aren’t too many bands out there that can do it better than Dissection and this full-length is usually one the first records I reach for when that time arises.